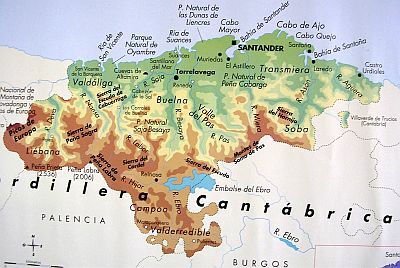 In the autonomous community of Cantabria, corresponding to the province of Santander, and located in northern Spain, the climate is cool and damp on the coast because of the influence of the Atlantic Ocean, while in inland areas it becomes colder with increasing altitude, and more continental in the south. On the coast (called "la Marina"), winters are mild and rainy, and summers are cool and fairly sunny. Atlantic frontal systems can affect this area all year round, though they become rarer in summer, when, however, thunderstorms can break out in the afternoon or in the evening. The wind blows frequently, in fact there are several beaches frequented by surfers. Fog is common as well: it can present itself all year round, when there is no wind, and even on summer nights, especially along the coast and in the valleys. In winter, cold air masses from the northeast can bring cold and windy periods, but on the coast very cold days are rare (the cold records are a few degrees below freezing). However, even on mild days the wind can increase the feeling of cold. Snow, very rare on the coast, is a bit more frequent in inland hilly areas, while in the mountainous peaks, heavy snowfalls can occur. On the coast, frosts are rare as well, and in any case, they are light, while they are more frequent, and at times can be intense, in the interior. In summer, temperatures are cool along the coast and in inland mountainous areas. In the south, although there are no plains, hot days are more frequent even at 600/700 meters (2,000/2,300 feet) above sea level, with highs around 30 °C (86 °F) or more, since this zone is close to the meseta, the spanish arid plateau. In summer, when high pressure systems are more common, there are many sunny days, during which, however, there can be morning mists, and thunderstorms can break out in the evening; there is also a fair amount of gray days, when a kind of drizzle falls, called morrina, especially in late spring and early summer. The rains are quite abundant in much of the territory, in fact they hover around 1,000/1,200 millimeters (40 to 47 inches) per year on the coast and in the hills of the north-central, so much so that the landscape is green; in mountainous areas, they can exceed 2,000 mm (79 in), while in the southern part (comarca of Campoo-Los Valles, see Reinosa, Valderredible) and in some sheltered valleys (Valley of Liébana, see Potes), precipitation drops to around 700 mm (27.5 in). Summer is everywhere the least rainy season. 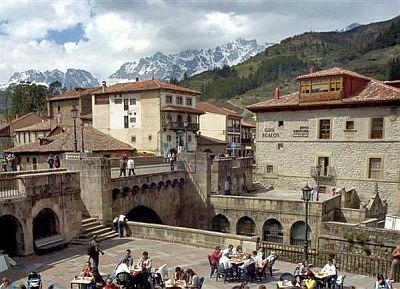 In the interior, we find hills, and in the southern part also a mountain range, the Cantabrian Mountains, which separates this cool and moist part of Spain from the arid plateau; in particular, in the western part we find the "Peaks of Europe" (Picos de Europa), shared by Cantabria with the region of Asturias. The wind descending from the mountains can cause rapid increases in temperature due to the föhn effect: in these cases, along the coast it may exceed 20 °C (68 °F) in winter, 30 °C (86 °F) in autumn and spring, and 35 °C (95 °F) in summer, when, however, this wind is rare. On the coast, there are bays and inlets, such as the Bay of Santander, or the lagoons of the Parque Natural de las Marismas de Santoña, Victoria y Joyel. About ten kilometers (6 miles) away from the coast we find the Secuoyas del Monte Cabezón National Park, where a forest of Sequoia sempervirens grows, while a few kilometers (or miles) away from the coast we find the Cave of Altamira, famous for its cave paintings of the Paleolithic, and UNESCO World Heritage Site. In Cantabria, the river Ebro has its source, in Pico Tres Mares, a mountain of 2,173 meters (7,129 feet); on the outskirts of Reinosa, the river widens into an artificial reservoir called embalse del Ebro, at 800 meters (2,600 feet) above sea level. 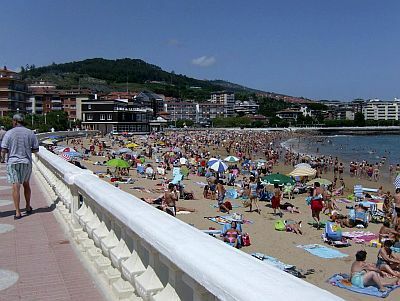 In the capital, Santander, located on the coast, the monthly average temperature ranges from 10.5 °C (51 °F) in January and February to 20.5 °C (69 °F) in August. The daily temperature variation is generally reduced because of the influence of the ocean. In summer, a season that often has the taste of spring, the temperature very rarely reaches or exceeds 30 °C (86 °F): it might not happen for a whole summer month. The lowest recorded temperatures are around -5 °C (23 °F) and the highest around 37/38 °C (99/100 °F). Santander gets an average of 1.115 mm (44 in) of rain per year, with a maximum in autumn and winter and a minimum in summer, when, however, it still rains for 8/9 days per month. The amount of sunshine in Cantabria is not very good: in July and August there are 6 hours of sunshine per day along the coast and in Santander; in the other seasons, and especially in late autumn and winter, it is even worse, and the sky is often cloudy. The sea along the coast of Cantabria is very cool even in summer, since it reaches 20 degrees (68 °F) in July and 21 °C (70 °F) in August, as you can see in the following table, on the temperature of the sea near Santander. The best time to visit Cantabria is the summer, from June to August or the first half of September, since it is the driest and sunniest of the year. July and August are the warmest and least rainy months. Even in midsummer we must take into account some rain, and some nights a little cool on the coast, and a bit cold in inland areas.